○Isolation of eight novel Caenorhabditis elegans small RNAs. Wachi M, Ogawa T, Yokoyama K, Hokii Y, Shimoyama M, Muto A, Ushida C., Gene 335:47-56, 2004. ○Distribution of the MCS4 RNA genes in mycoplasmas belonging to the Mycoplasma mycoides cluster. Ushida C, Yoshida A, Miyakawa Y, Ara Y, Muto A.,Gene 314:149-155, 2003. ○Central region of the human splicing factor Hprp3p interacts with Hprp4p. 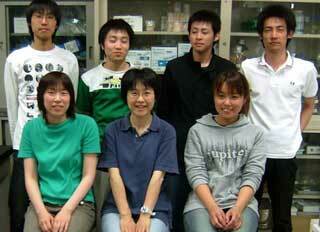 Gonzalez-Santos JM, Wang A, Jones J, Ushida C, Liu J, Hu J., J. Biol. Chem. 277:23764-23772, 2002. ○A bacterial RNA that functions as both a tRNA and an mRNA. Muto A, Ushida C, Himeno H., Trends Biochem Sci. 23:25-29, 1998. ○A small RNA of Mycoplasma capricolum that resembles eukaryotic U6 small nuclear RNA. Ushida C, Muto A., Nucleic Acids Res. 21:2649-2653, 1993.